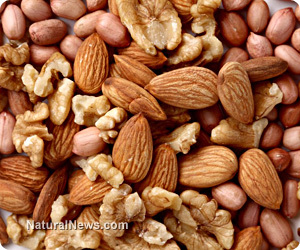 (NaturalNews) A surprising number of people avoid eating nuts as they retain the false stigma that the calories derived from a handful of nuts contribute to weight gain. Nuts also deliver a higher percentage of fat calories per ounce than many nutritionally deficient processed foods and are thus considered to be unhealthy. As the incidence of metabolic syndrome (six health metrics that increase risk of diabetes, heart disease and many other potentially fatal chronic conditions) continues to skyrocket in many unsuspecting individuals, a wealth of scientific evidence now shows that eating a variety of tree nuts is not only beneficial to our health, but also helps lower obesity prevalence in the adult population and aids weight management as part of a natural food diet. The researchers used a validated food frequency questionnaire to determine the daily intake of tree nuts and peanuts, both together and separately. The participants were then rated as to high tree nut consumption, averaging 16 grams per day, to low consumption with an average intake of 5 grams per day. Lead study author, Dr. Karen Jaceldo-Siegl noted "Our results showed that one serving (28g or 1 ounce) of tree nuts per week was significantly associated with 7 percent less MetS... doubling this consumption could potentially reduce MetS risk by 14 percent." MetS (consisting of increased abdominal obesity, elevated triglycerides, low HDL cholesterol, high blood pressure and hyperglycemia) signals metabolic deterioration as the body is forced to deal with a cascade of physical abnormalities that ultimately lead to cardiovascular disease, stroke, diabetes, dementia and drastically lowered quality of life. Regular consumption of tree nuts can lower the risks associated with MetS as they help to balance oxidized cholesterol ratios and improve vascular function, largely due to the quality, monounsaturated fat content and wealth of minerals supplied in a handful of the small tasty gems. Another benefit found by the researchers is lowered body weight. Although nuts are relatively high in calories, they squelch appetite by providing a solid source on non-animal protein and have little to no impact on blood glucose levels. Additionally, there is some evidence to suggest that the monounsaturated fats are conserved by the body for cellular metabolism and are not readily burned as a source of fuel by the body. Dr. Jaceldo-Siegl concluded "We found that high tree nut consumers had significantly lower prevalence of obesity compared to the low tree nut consumers... and, high consumers of tree nuts had the lowest prevalence of obesity when compared to the low peanut/tree nut groups." Nutrition experts recommend eating 1.5 ounces of tree nuts each day, the amount in a good size handful, to ward off chronic disease processes and help keep weight in check.